A low-cost, no frills epilator from the well-known Braun Brand which is designed for corded, dry use only and suitable for leg hair removal. Manufactured in Germany, it is at the bottom of the Silk-Epil Range from Braun and lacks the added features of the more expensive models. It would be a good value-for-money option for first-time users wanting to try out epilators or anyone on a budget. ​Other models in the series are the Silk-Epil 5, Silk-Epil 7 and Silk-Epil 9. The Silk-Epil 3 has an easily detachable epilator head, with a series of 20 tweezers on a roller. It can be removed for cleaning by depressing the little buttons on either side of the head to release it. It is returned by simply clicking the head back into place. The device is fitted with a detachable cap featuring 2 massaging rollers. The idea of these rollers is to stimulate the skin before and after the hair is pulled out, to make the experience more comfortable. This cap is detached easily from the head by pushing off from the back for cleaning, but should always be in place when epilating. The Silk-Epil 3 has dual speed control, the slower speed for gentler epilation and the faster speed for more efficient, quicker epilation. As shown in the pictures above, the switch is set to 0 for the "off" position, I is for the slower speed and II is for the faster speed. The integral light, located at the top of the power switch comes on automatically when the device is switched on. The inclusion of the light is quite a good little feature for a relatively low-cost epilator. It is positioned so that it illuminates the skin being epilated to show up any hard to see, very fine hairs that might otherwise be missed. The device has a mains adaptor for corded, dry use only. This particular model is designed for use on the legs and is not recommended for other parts of the body. The only Silk-Epil 3 model which is recommended for use on legs and body is the Silk-Epil 3 3370. This model includes the added feature of a sensitive area cap, for underarms and bikini-line, to make epilating more comfortable in these particularly sensitive areas, but is more expensive. It is not possible to be precise about this, as it depends on how dense the hair is and the speed you are using. Obviously, as with any electrical device, it is important to read the instructions through thoroughly prior to use, paying particular attention to safety precautions. Optimum Hair Length - epilation is less painful if hair is at the optimum length of 2 - 5mm. The longer the hair the more painful the epilation process. Guide it, without exerting pressure, from bottom of leg to top, against the direction of the hair's growth. Epilators are basically electronic tweezers, which are able to pluck many hairs both quickly and simultaneously. The Silk-Epil 3 3170 model has a series of 20 sets of metal plates on a roller. As the roller rotates, the plates come together and then apart again in a pincer movement, to trap the hairs, pull them out and then let them go​. Using an epilator for hair removal at home has one distinct advantage over shaving, waxing and depilatory creams; you have the initial outlay and that is it, apart from possibly the very occasional need for replacement parts. The main advantage epilators have over shavers is that they have longer-lasting results. Whereas shaving is more or less a daily activity for most, epilators pull hair out at the root and therefore the results can last for several weeks. In addition, regrowth tends to be finer and without the stubble effect of shaved hair. ​Obviously this is offset against the fact that shaving is pain-free and epilating most definitely is not. Although waxing has a similar effect to using an epilator, it also affects the surrounding skin, taking the top layer off with the hair, which the epilator does not. Also, epilators can be effective on much shorter regrowth (as little as 0.5mm) and it is not at all messy. Depilatory creams last a little longer than shaving and are pain-free (providing you have no allergies to the ingredients) but again, the results of epilators are longer lasting. I see the main advantage as being that depilatory creams use strong chemicals to dissolve the hair, which can be very harsh on the skin and not environmentally friendly, whereas epilators do not. The level of pain is difficult to quantify, as each individual's experiences differ as does their threshold for pain. If you have ever tweezed hair, perhaps if you can image the pain from that magnified significantly, it will give you a clue. It is likely, especially for the first few times, that you will experience some redness and/or irritation of the skin, but it should pass very quickly. 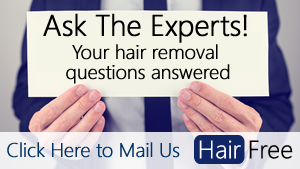 The other risk with any form of hair removal that involves plucking hair out at the root is that of ingrown hairs. We have published various articles about ingrown hairs﻿﻿ and how to avoid them​. ​Can it be used for underarms? ​Does the hair grow back thinner? Can you wash the head under running water? 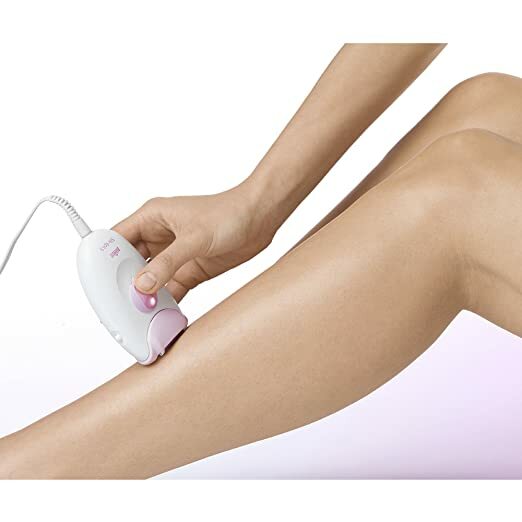 This epilator is easy to use and works well for its intended purpose - leg hair removal. If you are a first time epilator and want to try it out without paying too muc​h, this could be for you. I would say though, that there are products on the market at a similar price that can also be used for underarms and bikini-line, so it is worth thinking about this prior to purchase.